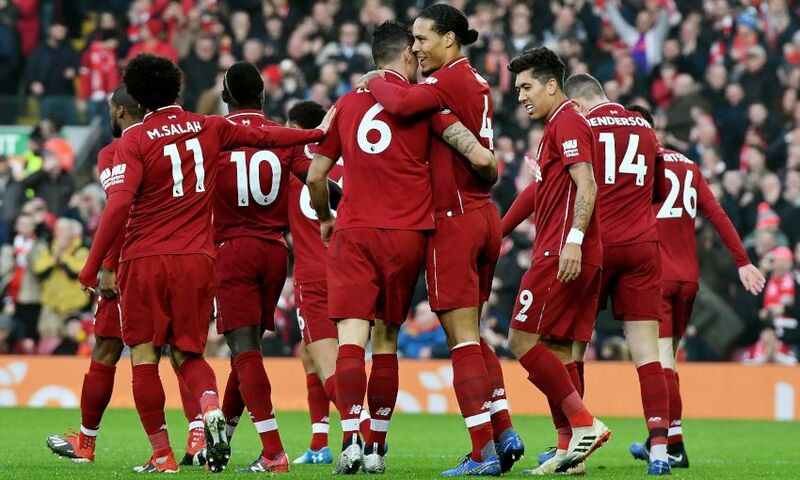 Liverpool stretched their lead at the top of the Premier League to six points with a 4-0 win against Newcastle United at Anfield. Dejan Lovren’s thunderous strike in the 11th minute gave the Reds an advantage during a tight opening half with Rafael Benitez’s side. 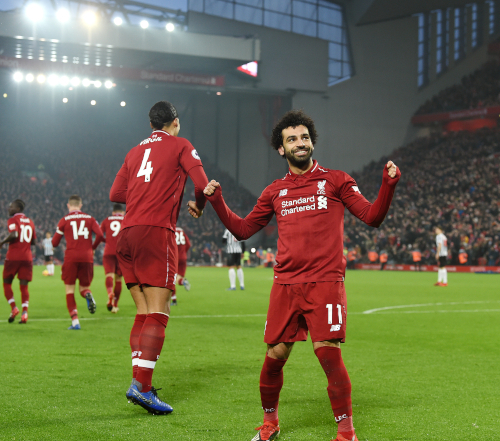 And Mohamed Salah doubled the score almost immediately after the restart by winning and converting a penalty, before Xherdan Shaqiri and substitute Fabinho added late gloss. Jürgen Klopp’s charges have therefore reached the halfway stage of the season without defeat and remain the pace-setters after 19 Premier League games. Klopp made three changes to his starting XI – one enforced – with Trent Alexander-Arnold, Shaqiri and Georginio Wijnaldum brought in. James Milner was left out of the matchday squad due to a minor hamstring injury, while Fabinho and Naby Keita dropped down to the bench. Though Liverpool tried to assume control of the game in the same manner they so often do at Anfield, it was the visitors who perhaps should have opened the scoring. Matt Ritchie’s deep cross from the left on eight minutes evaded the leap of Virgil van Dijk and found Joselu free to head at goal – but the Newcastle striker’s effort bounced off target. Shaqiri would have punished them within moments if he had connected more cleanly with Sadio Mane’s pull-back from the byline after Roberto Firmino’s clever pass. Instead, the breakthrough came from an unlikely, but emphatic, source. 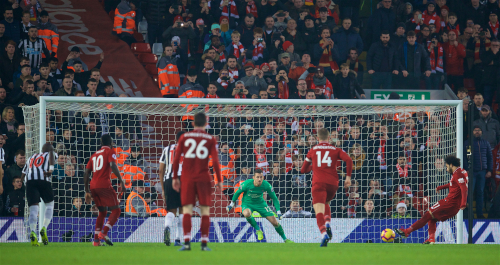 Andy Robertson’s hoisted cross towards the far edge of the Newcastle area was not sufficiently cleared and Lovren opted for an immediate wallop back across goal that sent the ball soaring unstoppably into the top left corner. Buoyed by the opener, Klopp’s men quickly sought a second, and Mane might have provided it with either of two successive chances. The Senegal international could not collect Alexander-Arnold’s raking pass around the opposition defence from his own half and then did control Firmino’s excellent clip into the area but touched it too close to the goalkeeper. And, from there, the Reds were repeatedly frustrated by Newcastle’s organisation and diligence, with little in the way of genuine opportunities. Only a more direct approach troubled Martin Dubravka between the Magpies’ posts – Shaqiri’s well-struck free-kick a minute before the break flicked the top of the wall and drew a smart save on the stretch. Liverpool’s objective to increase their cushion was achieved within two minutes of the action resuming following the interval. Salah dribbled threateningly into the Newcastle area from the right side and was brought down by Paul Dummett, prompting the referee to award a spot-kick. The Egyptian took responsibility from 12 yards himself and tucked his shot into the bottom left corner, past the reach of Dubravka, for goal No.15 of the season. It should have been three soon after but the away team cleared off the goalline when Mane, played through by Shaqiri, tried to find Firmino, before Joselu flicked a header just wide at the other end. Both teams contributed to keeping the encounter lively, with half-chances for each, and just when it seemed the scoring was finished, the Reds bagged two more. A flowing move saw the ball turned from Jordan Henderson to Alexander-Arnold and into the middle for Shaqiri to tap in from yards out, and Fabinho then nodded in Salah’s corner for his first Liverpool goal as the noise inside the ground grew. And so Klopp’s men – now 30 games unbeaten at Anfield in the Premier League – consolidated their hold on top spot as a belated Christmas present. Next up, Arsenal on Saturday.